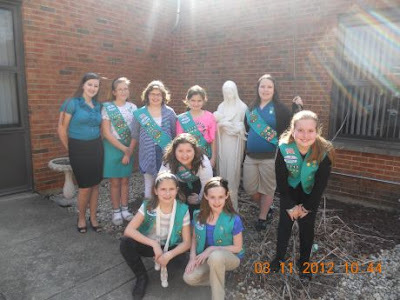 In Illinois, Trib Local reports that over the past few months, Junior Girl Scouts in the fifth grade have met several times on Sunday mornings in the Teen Room at St. Michael Church to complete the requirements to earn the Puella Mariae Religious Award. Amanda Marino was the teen facilitator of the sessions. She has had the opportunity to earn this award as a Girl Scout and is thankful for the chance to work with these young girls as they journey in their faith. For some of the girls in the group, this is the third religious award they have earned. "It is an inspiration to watch the girls and share their dedication," comments Amanda. The Puella Mariae Medal is a recognition that the Archdiocese of Chicago awards to youth for advancement in religious knowledge and spiritual formation. The Latin name means "Child of Mary." The Puella Mariae program is designed for us to share discussion and devote our time to Mary. "Some of the requirements involving our devotion to Mary," Jillian Marino explains, "included reading about her life and discussing what kind of person she may have been. We also learned when and why her Feast Days are celebrated. There was a lesson about how to pray the rosary and follow the mysteries. We learned to pray the Memorare to keep us close to Mary. Our group learned about our parish history and took a "virtual tour" of St. Michael Church. One of our members, Emma Woods, described St. Francis Church to us. We discussed the Corporal and Spiritual Works of Mercy and how we can live like the Blessed Mother following her example in our thoughts and actions." "Other requirements we fulfilled included learning to pray the Hail Mary in different languages such as Polish, French, and Spanish. We even learned that the prayer can be shared in song and sign language," Lauren Niedziela recalls. "Our lessons covered the Ten Commandments and a comparison to the Girl Scout Law and Girl Scout Promise. We were surprised to learn how many similarities there are between them. We talked about different types of crosses their appearances and meanings. We learned about the parts of the mass and how people our age can participate. Finally, we talked about Baptism and First Holy Communion and drew pictures of symbols of the sacraments." On Tuesday, April 24th, Fr. Paul blessed the Puella Mariae medals and distributed them to Emily Kaderabek, Grace Kupczyk, Jillian Marino, Lauren Niedziela, Colleen O'Finn, Katie Pasquinelli, Danielle Schleyer and Emma Woods (St. Francis) at a ceremony in the Adoration Chapel of St. Michael Parish.